Dissecting a pinto bean seed is a great way to learn about seed growth. A bean is a simple seed with only a few, easily identifiable parts. This makes it a great learning tool in a classroom or home-learning environment. Encourage students to draw and label the pinto bean seed parts. Then let them plant a few seeds to watch them grow. 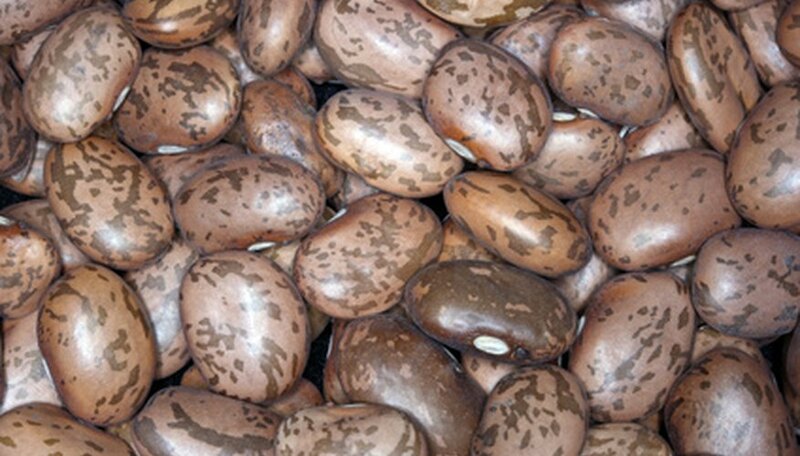 The seed coat is the mottled brown outer layer of the pinto bean seed. This layer is thinner than a sheet of paper and its function is to protect the white, cotyledon layer below. The micropyle is the small pore located on the seed coat that allows the pinto bean seed to absorb water. When the bean was still in the ovule stage, this is where the pollen tube entered the ovule to fertilize it. The hilum of a seed is the scarred portion of the seed coat. This scar is similar to a human belly button--it marks the place where the pinto bean seed was attached to the main stalk where it developed before it was harvested. The cotyledon is the stored food of the pinto bean seed. When you cut the seed in half, the cotyledon fills up the majority of the seed and envelops the embryo. The embryo is located inside the pinto bean. The best way to find the embryo is to cut the pinto bean seed in half lengthwise. The embryo will be attached to the hilum. It looks like a collection of fibers nestled in the cotyledon. The embryo is made up of the radicle, which is the part attached directly to the hilum; the hypocotyl, which is the stem-like section attached to the radicle; and the leafy epicotyl, which extends from the hypocotyl. ABC Teach: What are the Parts of a Seed?